The recent and relative boom in the Chinese economy has created a lot of disposable income industries to absorb that income. A new trend among the wealthier Chinese is domestic and regional international air travel. The Beijing Capital Airport is a sprawling three terminal airfield with two separate metro stops. Each terminal is four stories and they are all interconnected by free trams. While a huge amount of international flights land in PEK, there are an increasingly large amount of domestic flights as well. Websites like ctrip and elong, in addition to the well-adapted cits have made flights incredibly accessibly and affordable. 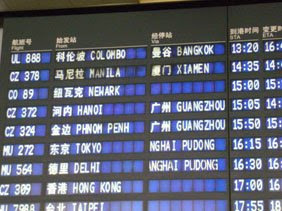 For example, right now I am researching flights to Taiyuan, a regional capital in which my friend works as a teacher. The city (of about 3 million people) is a few hours from Beijing by train and a bit over and hour by air. I'm seeing round trip ticket prices ranging from $25 USD to $60 USD from a variety of carriers. They say Macau is the Vegas of Asia. The pictures I've seen of the architecture seem to support that. International travel is more expensive but certainly accessible, as many international carriers are opening up new Asian routes every day. You can see at left, most flights are still coming from the Asian sub-continent. Veronica's mother, Mary, took advantage of the non-stop flight from newark being offered by Continental. My parents are coming into shanghai via Delta and then transferring.